PHANTOM RMR-C450 is the world's only VOICE ALERTS high performance 360' radar/laser detector combined with a front 180° top quality radar and laser scrambler in one sleek package. The detector compares favorably with the best detectors in the market. The scrambler makes your car invisible to both radar and laser and works so well it is backed by a one-year ticket rebate. 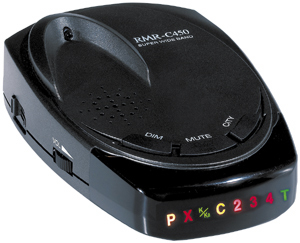 RMR-C450 is one of the newest and best radar and laser VOICE ALERTS detector/scrambler on the market. It will visually and audibly notify you of police radar and laser guns attempting to read your vehicles speed. The RMR-C450 will also scramble all radar and laser signals from a police radar or laser gun returning a blocked signal, making it virtually impossible for police to read your vehicles speed. RMR-C450's state-of-the-art radar and laser detector will cover your vehicle a full 360° while the radar & laser jamming portion will cover the front of your vehicle 180° for unbeatable protection. The RMR-C450 is a passive device and completely legal in all states except California, Nebraska, Minnesota, Oklahoma, Virginia and Washington D.C (certain restrictions may apply in certain states  check with your local authorities). The manufacture is so confident in RMR-C450's effectiveness, they have included free with your purchase, a one year ticket rebate program which will pay any ticket you receive for one full year (some restrictions apply).